My connection is downright atrocious this morning, so it might take me a while to respond. But respond I will! In the meantime, I hope the other members of the community here will step up and put their two cents in to try and help out as well. Will I be the first again? When otaku, or anime fan dies, Grim Reaper does not come for him (or her). Instead he sends his cute daughter. Kawaii! I thought I at least had a pretty solid chance of at least a mention. So what could I have done better? Or was it just because Tartan isn’t an actual color? For me personally. He’s too dark, but then I am legally blind, so a lart of dark tones muddle my eyes. I would have taken a circle to cover the ribs showing behind the dress, the making it all white to hide the circle as well putting your background pattern over it. 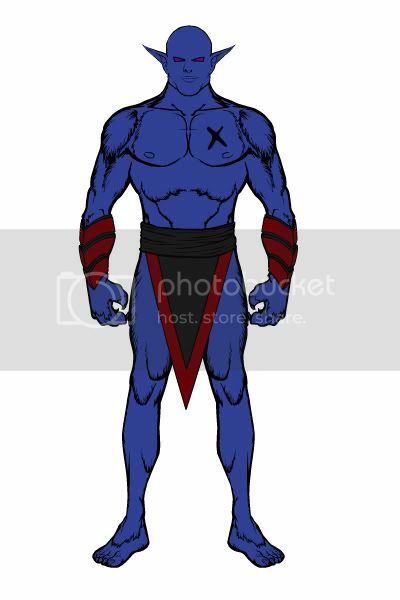 This is Boodeyman, dark superhero. I like the image’s simplicity. I think I agree with Cliff (5) that the image tones; mostly just in the face though. The issue I have is that because the skin color is so dark the facial features blend in. I think a little more constrast would help. For example, lighter colored eyes, etc. That’s a little disturbing which I’m sure is what you were going for. I’m not certain about the color choices of pink and green in the background. Perhaps two different shades of pink would be worth trying. I agree with Cliff about the ribs showing past the dress though. It would help quite a bit if they were not visible. 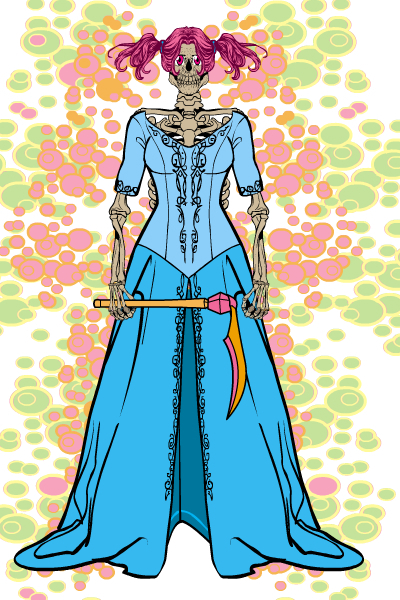 Also the dress could be moved up slightly so that the color bones don’t protrude from the top. I’m not sure of the background color on this one. Any thoughts on the background or anything else? 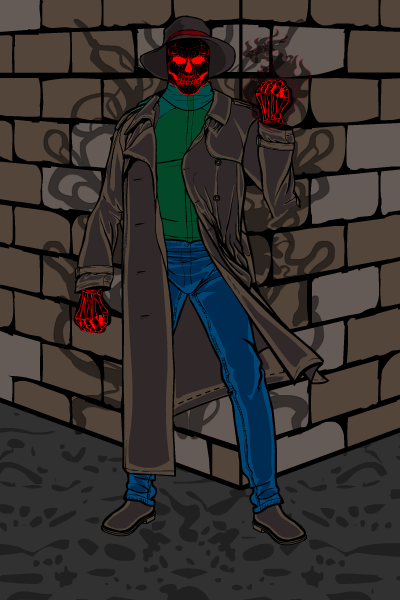 The character is a computer hacker in an X-Files style game. Sorry man but I can’t see your link. alphaalpharomeo (1): Simple designs can be very effective, but the key to them is that with so few elements, everything about them has to be perfect. I think that’s what’s going on here — the design itself is good and the items are well chosen, making for a fundamentally sound character, but the color choices have let you down. Keeping the same dark blue throughout the figure flattens it out and makes the details hard to see. I think going with a slightly lighter blue as a base color with even slightly lighter highlight colors would help the whole thing pop more. Because you have such a dark blue tone, the dark red tone for the accessories also becomes hard to see. I think you need to lighten that up some as well, although once you do that to the body it may be that the clothing will stand out enough even if kept dark. But regardless, it needs some internal contrast to work. The black interior color on the arm bands, for instance, might be better with some brighter color like a glowing blue or something. Malfar (2): Definitely a creepy image! I love the contrast of the bright, frilly, princess colors and hair with the skeletal body. The pastel background bubbles work great, too, setting up more of that fluff-vs-creep dichotomy. Personally I like the rib cage showing through the cleavage, I think that’s another nice creepy touch. The only part that makes me pause even a bit is the lack of leg showing through the dress. I know that’s where the legs just happen to fall, but it might be nice to have one poking through on one side or the other, because as it is she seems to be hovering legless. Oh, and maybe add like an undead cat with zombie guts or something! Ahem. Got a little crazy there at the end, apologies. I like the mix of purple with black and red. I also like the simplicity of the composition, losing nothing overall. The one place I think could use more contrast is the face, it seems void of personality. Also the lack of facial hair, seems to not match the rest of the furry body. Very originial concept, actuall pretty funny. Overall it’s a really nice composition from the character to the background. The faults I find with it are few and very easily fixed. First Flaw: Skeletal ribs protrude from behind dress / Fix: Using seperate skeletal arms and torso, mask torso only to a triangle insignia/background lined up behind, in position with the dress. Alternatives also available such as Cliff’s suggestion. Second Flaw the dress is low, not covering her shoulders / Fix: slightly reposition dress. Last Flaw: Dress back missing / Fix: If First flaw is fixed the way I suggested, it should clear this one up in the process. Says your page is missing? I like the skeleton, his coloring, and the steam coming from him, makes him look brimestone hot. The outfit seems not to fit. I think the troubled spots are the hat, brown leather coloring, or maybe the green shirt. Also I think a slightly darker background, not enough to engulf the character, would accent the general concept. I actually think he’s a very cool concept, and kinda get a modern day cowboy vibe from him. That’s just my opinion, hope it helps. Cliff (4): I had to take the “&newest=1” off the end of the URL for that image to resolve. I applaud your efforts on this one, particularly in the hand crafting of a set of bagpipes. That’s very nicely done. For me the main problem with the piece in terms of the contest was that it wasn’t very “Kirby”. The helmet’s way too plain, and the other accessories don’t have the insane gimmicks and gew-gaws that are the King’s trademark. Beyond that, just as an image, the colors bother me a fair bit. Green and red next to each other just say “Christmas” to me, which I don’t think is the vibe you were going for here. On the chair it’s distracting, pulling attention away from the nice tartan pattern in the tabard and bagpipes. It also doesn’t seem to match up with the colors in the body, which makes the character seem disjointed. I think making the chair match the body colors would make the accessories stand out a lot more, and unify the figure itself. Rozenstal (7): I can’t get to your image at all, unfortunately, I just get a “Service Unavailable” screen. MMI (10): I actually like the background a lot with this image. It’s “there” enough to support the idea, without detracting from the impact of the character, whose strong colors and graphical elements (the nice bouquet of flowers in the shirt, the tiger stripe kerchief, etc.) need room to stand out. In fact, I think this is about the only way to use this particular background effectively. Nice job! I like the character too, he looks cool. The one thing I might address is the lip color — it definitely looks like he’s wearing bright lipstick. If that’s what you’re going for, never mind. Thank you Jeff. Lip color, got it. In fact, that’s the second image of mine you’ve made that comment on. Since you suggested that last time I’ve started lightening the lips up a bit but this character was made before that. Freakshow – I made this guy to be a lunatic with a straitjacket meets evil faceless clown.I could use some advice about the straitjacket because he was supposed to be very thin but there are no tops for that body type. My entry to the Kirby Kontest. I assume, based on your response to Cliff’s hero, that you didn’t think it was Kirby enough. 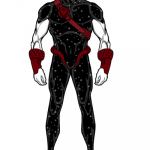 I tried to make the costume leaning toward Galactus-level complicated, but considering Kirby designed Darkseid, Challengers of the Unknown, and Silver Surfer (perhaps the simplest design ever! ), I didn’t think our designs had to be too far out. Wow, that is really sinister! I saw this image and instintly liked it. I think the jacket looks great. Normally the color selection you used would’t do much for me but for this concept it actually fits. I’m hard pressed to find anything I don’t like Alex, well done. Just in time for Halloween to. Thanks MMI I’m happy that you like it and now that you mention it I’m invited to a friends Halloween party so maybe my costume design is ready! Krazy (20): I like the overall look of the illustration. Your choices on the line color are great, it gives the whole thing a very animated feel. The background works well too. I can’t say I get a real “dwarf” vibe from it, though, to me a dwarf needs super wide shoulders and stockier limbs. But he looks cool regardless. Alex (21): Love it! The thinness of the figure is very convincing, and all the item choices are perfect. A spooky looking, scary, interesting, and yet fun looking dude. Great job! I don’t have any suggestions for improvement, I think you pretty much nailed it. Rosco (22): I loved the idea of the character, riding on a stellar bicycle with flaming wheels. The swoop of the hair and cape work great too, selling the idea of her cruising through the cosmos. The gloves and the helmet were good choices, too. I think the main problem with the image for me was that the pose (while innovative, and I give you credit for trying something outside the box) just isn’t very convincing. The belt and skirt in particular jut too far out to the side, leaving a weird space with no hip in it. Similarly the legs are too thin, she looks a little sickly. The other area I might think about would be in color choice. Having the same yellows and reds on the cycle, road, wheels, and body make them all sort of blend in to each other. I think choosing a different skin tone would help separate her out from the other elements. But overall, high marks for innovation and concept! Here’s a combat mage I’m working on for a Steampunk-set Shadowrun campaign. Bear in mind that part of the game’s setting is that the air is so polluted that everyone has to wear gas masks and goggles. 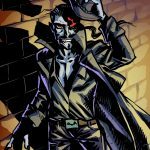 Has anyone here ever checked out CAPTCHArt Comics (www.captchart.com)? It’s all comics based on the wavy word verifications from CAPTCHA. This is one of my early submissions that doesn’t seem to have made it onto the site. The first thing that came to mind is that her hand seems to protrude from the stock of her gun. Perhaps send the stock back behind the rest of her arm. TheNate (30): I like it! Nice sense of movement with the hair and the pose. The steampunk elements are well placed and not too obtrusive, definitely giving the flavor of the genre without being over the top. The tornado as smoke is an interesting effect. I like it, but I’m not sure it works, if that makes any sense. I agree that the major problem is the gun stock — move that to the layer below the arm and that would solve it neatly. Hi gang! This is my redo of the public domain character Gunmaster. I traded the purple for blue. Everybody please feel free to critique my Gunmaster. Kingmonkey (31): I like it! Very funny. kyle (32): Pretty cool! I like all the robotic stuff on the one side, especially the two arms. The way the fist is makes the whole thing look a lot more dynamic. The head is good, too, and I like the sky background too. The hand holding the rock is awesome, I haven’t seen that effect before and it totally works. I’m not sure the sand part of the background works as well, though. Mostly I think it’s the color — if that were toned down a few steps, I don’t think it would be quite so in-your-face. Finally, I’m not sure what’s going on with the lower body. It looks like a hover-bot kind of thing, but then I see what looks like might be an elephant-type leg on his left? In any event, I can’t tell what all is going on down there, so cleaning that up by rearranging the elements would help a lot. Danny (35): He looks fine — not sure what all to say about it, as it’s pretty straightforward. I don’t think just the color change (while welcome — purple was lame) is enough to really elevate it to a true “redesign” or retcon, but it’s nice enough. Hope this works, doing off my phone. Something unintentionally silver-age about this picture in appearance. Myro (40): LOVE LOVE LOVE that background! A very simple effect but damn, it looks awesome. Overall, a nice take on the classic “witch” outfit. I like the cape and basic costume a lot, it works well together. I’m less enamored with the skull staff. Something about the purple skull on such a simple haft doesn’t quite work for me … I think a more gnarled one from Polearms or something would look better. I also am not crazy about the light blue skull belt … something about the colored skulls is just odd for me. Here’s a gannum, a member of the race that my clerical contest submission also belongs to. They are, as this one appears, short and with much body fat, and are usually very intelligent and wise. There’s nothing really special about this one. Any thoughts? I know the clothing, especially the top, is a bit odd, with the open shirt and all; it’s basically traditional clothing for them, in case you were wondering. I certainly prefer the blue over the purple. Jeff – I was reworking tbe charater from one I did in 2.5. And, yeah, the skull belt was originally silver-white. I guess I changed the colors to match the amulet and armbands, as well as the skull sceptre (which was originally a violet blue). You may have a point, maybe do both the sceptre and belt in the original silver-white. I like your suggestion that the sceptre shaft should be more gnarled, definitely work that in. @Myro (#40): Everything but the blue stuff works. I don’t think she needs any kind of a belt. I really like the character! @Alex (#21):I like Freakshow! Good job! The source of her power is her boot right? Her left boot. Myro, that was going to be my second guess. Darn, just missed it. Here is a character that I’m proud of and I would enjoy to hear everybody’s opinion on him. 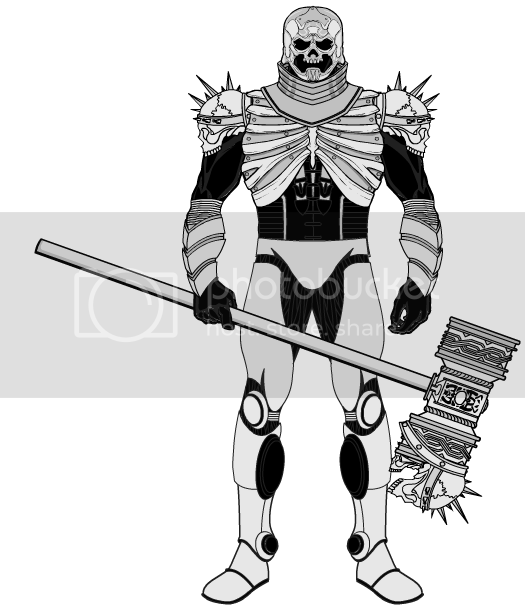 Here is Crusher, a superstrong mercenary with a big hammer. Jadebrain (42): What a fun character! Very unusual and creative use of the program, I approve. I like the “can do” attitude the pose conveys as well. Vampyrist (52): I’m not usually a big fan of skull-sporting characters, but this one really rocks. I love the simple and consistent colors, that manage to remain the same without blending the character into obscurity. The head and neck collar combination works great. The only minor quibble (and it’s very minor) is that you might want to nudge the head of the axe over a few pixels to the right — currently the teeth on the lower skull intersect with the outside line of the leg, which creates a visual stumbling block as the eye tries to separate out one form from the other. Like I said, totally minor, but it’s one of those things that is super subtle yet can make a big difference. GREAT job on it, though, I really like this guy. And with that, we’re done. Thanks to everyone for participating! I’ll leave the thread open in case anyone else wants to post or comment, but I’m headed off to enjoy the weekend and won’t be making more critiques until next Friday’s open thread. Jeff, has loaded on other server.